IObit Malware Fighter Free has been updated to version 3 with a range of new features and enhancements. The "Browser Protect" module provides real-time protection for your home and search pages, blocks some malicious sites, eliminates malicious toolbars, and prevents malware modifying your system DNS settings. The extended Security Guard offers six "guards" to protect various areas of your system: "Network", "File", "Startup", "Cookie", "Browser" and "Security Reinforce" to highlight possible Windows security issues. A "Silent Mode" seems to be the equivalent of "Game Mode" elsewhere, allowing the program to take action without any of the usual alerts or pop-ups. New support for Windows 10 Technical Preview is welcome, although it'll be interesting to see whether it works in the upcoming release. IObit also claims an expanded database and improved engine delivers better detection rates and more thorough malware removal. In addition, a Pro build adds anti-tracking protection, Process, USB Disk and Malicious Action Guards, and more thorough real-time shields. 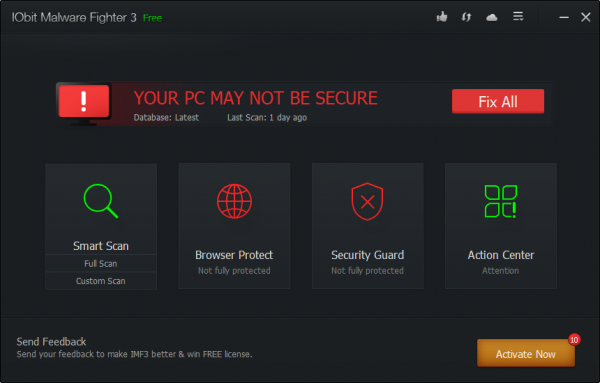 IObit Malware Fighter Free 3 is available for download now.